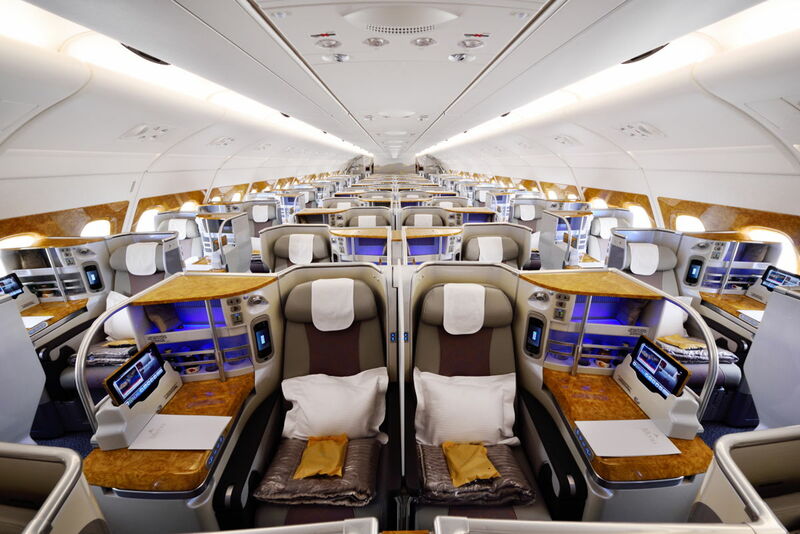 Home » Blog » Etihad vs Emirates Business Class: Which is better? Etihad offers a free Mercedes Benz chauffeur drive service to and from Abu Dhabi International Airport, but has discontinued the service in all other destinations. So you’ll be able to use this service to get to and from anywhere in the UAE but if you’re flying out of London or elsewhere you’ll have to pay for the Airport Transfer service. Emirates meanwhile still offers a complimentary chauffeur service in more than 70 cities worldwide, so if you’re flying in Business Class you’ll be able to travel to and from the airport in style as part of the service. In Dubai you’ll be transported in a swanky BMW 520i Touring. Who wins? Emirates wins hands down when it comes to chauffeur services. Etihad’s Business Class checked baggage allowance is generally 40kg and passengers are allowed a maximum of 2 bags weighing up to 32kg each. Business Class passengers travelling on Emirates are allowed 40kg of baggage and can check in up to 10 pieces of baggage as long as it stays within the checked weight limit. Both airlines therefore have the same weight limit but Emirates is better if you need to travel with more bags. Who wins? It’s a close call, but Emirates for the extra bags. If you find yourself on Etihad’s A380 or 787 Dreamliner you’ll have your own Business Studio, which features a seat that converts into a bed measuring 6 feet and 8 inches long. Seats offer slightly more privacy than with Emirates, since they have both seat and aisle dividers that make you feel like you have your own private room. The layout is also slightly different, since seats are arranged in a dovetail design with forward and rear facing seats to create a feeling of more space. Window seats alternate between being close to the aisle or close to the window; centre seats alternate between being close together or further apart. On other aircraft types Etihad offers flatbed seats with direct aisle access, or Business seats with “generous recline” and ample leg room. Emirates operates a fleet of Boeing 777s and A380s, so seats vary according to the aircraft type. Emirates’ A380 cabin is arranged in a staggered 1-2-1 configuration, with soft leather seats that have direct aisle access and convert into fully flat beds. As with Etihad, the middle seats are either right next to each other or have a console between them, while the window seats alternate between being close to the window or close to the aisle. Personal in-seat mini bars are also a nice touch. The airline’s newest Boeing 777-200LRs, however, have a 2-2-2 configuration in Business Class, while the latest Boeing 777-300ERs have a 2-3-2 layout, so not all seats have direct aisle access. The Points guy explains the difference between Emirates’ seat types here. You’ll be pleased to know, however, that Emirates unveiled its new Boeing 777-300ER product, which features new seats which have been designed to resemble the seats of a sports car, with cross-stitched leather upholstery and a pitch of 72 inches. When it comes to bedding, Emirates supplies a comfy mattress and a blanket, or a new soft, charcoal grey duvet which is available on some flights. Etihad offers full-size comforters and pillows. Who wins? Both have slick seats, but the current Etihad Business Studios are slightly more evolved. 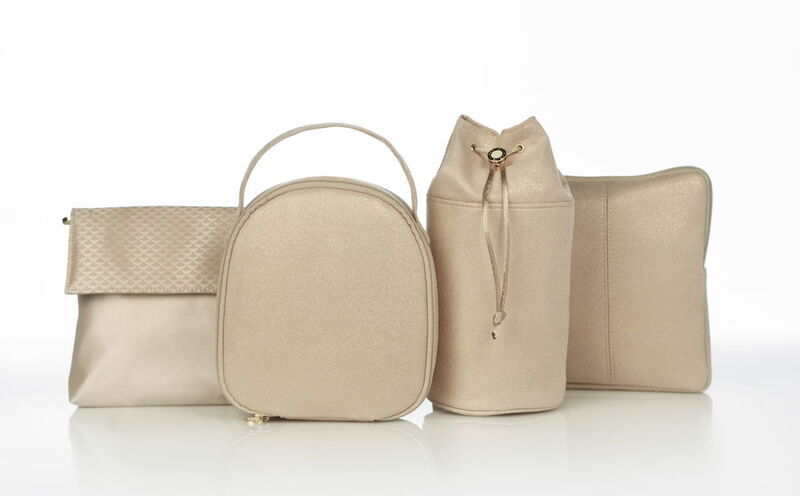 Emirates has recently refreshed its Bvlgari Business Class amenity kits to include a new fragrance called “Eau Parfumée Au Thé Vert”. Eight designs are available in Business Class – four for men and four for women. The kit is rather luxurious, with Bvlgari skincare essentials, a foldable hair brush, tissues and Colgate toothpaste. 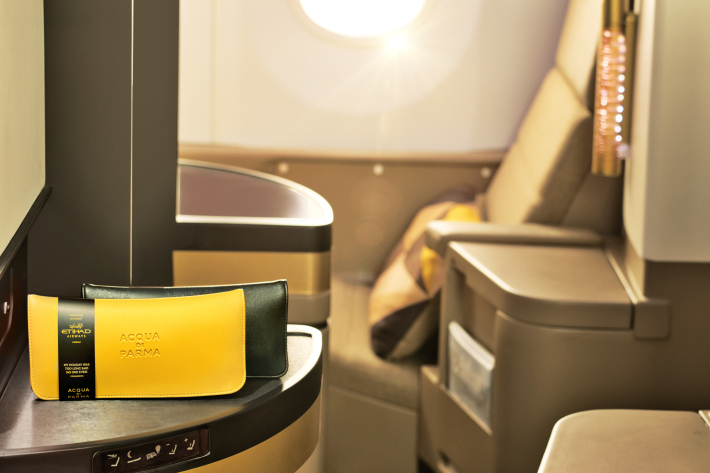 Etihad’s amenity kits are available on ultra-long-haul flights and long-haul overnight flights. If you’re travelling in the daytime, you won’t receive an amenity kit – instead dental kits, earplugs, shaving kits and “sleep packs” with socks and an eyeshade are available upon request. The current kit is a very stylish Acqua di Parma kit, which comes in two colours; yellow and black. The wallet-style bags can can be buttoned to create a stylish and useful valet tray, and contain a Colonia sampler and hand cream, along with other goodies. Both airlines offer luxurious amenity kits: the only difference really being that Emirates offers separate kits that differ slightly for both men and women, whereas the Etihad kits are unisex. Who wins? We’ll call it a tie on this one! 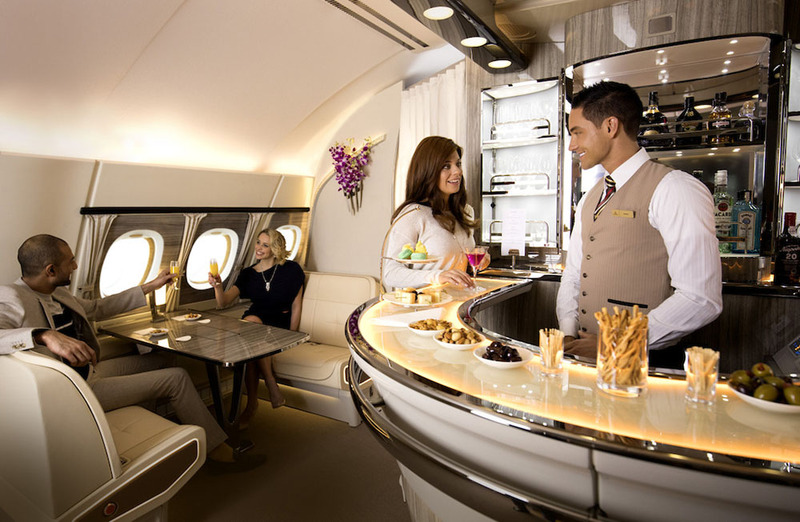 Emirates has an Onboard Lounge on the A380, which has a fun, social atmosphere. A firm favourite amongst travellers, the lounge features a clean ivory palette, calming mood lighting, a 55 inch LCD TV screen and of course, bartenders serving cocktails and nibbles. Meanwhile Etihad’s A380 has “The Lobby”, which seats up to six guests and is fitted with seatbelts, power supply, a widescreen TV and connectivity ports. The design is inspired by spaces found in boutique hotels so it feels more intimate but it isn’t as fun and social as the Emirates lounge. 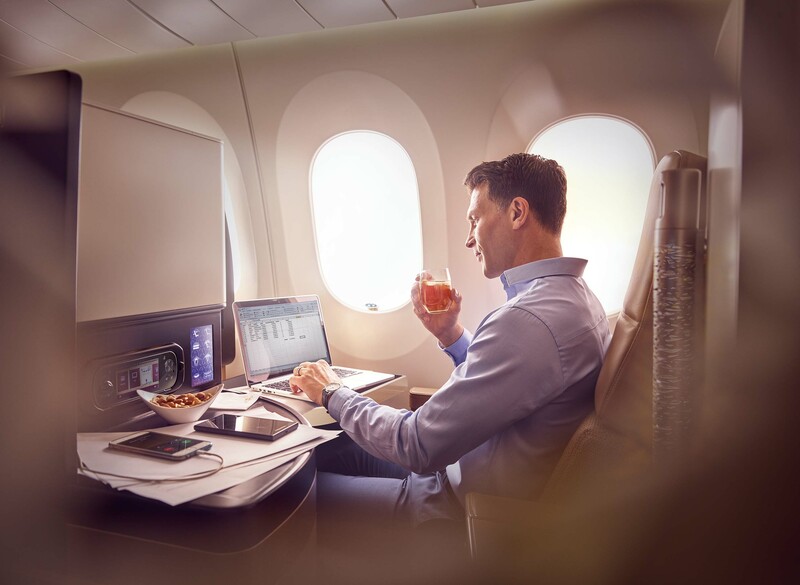 Etihad’s Business Studios feature 18.5″ entertainment screens, while the Business Flatbed seats have 15.4″ touch-screen TVs. Etihad E-Box has over 140 movies, more than 350 popular TV shows, full box sets, 7 live TV channels showing news and sport, 16 radio channels and up to 60 interactive games. Emirates has larger entertainment screens measuring 23 inches – some of the largest in their class. The ice entertainment system allows you to choose from more than 3,500 channels of movies, TV shows, music, and games, on demand and in multiple languages. Who wins? Emirates, for the bigger screens and more options. 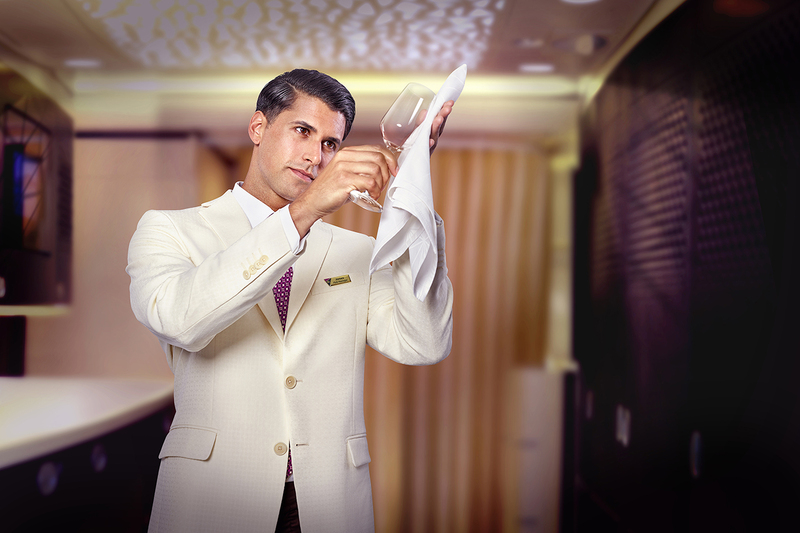 When it comes to food and drink, Etihad offers Dine Anytime menus, meaning you can dine whenever you like. The airline also has a team of “Food & Beverage Managers” who have the experience of working in the best hotels and restaurants around the world. On flights from London to Abu Dhabi, meal options include things like Arabic Mezze and Seared Tuna to start and Beef Fillet or Prawn Machboos for mains. The champagne served onboard is a Piper-Heidsieck Brut. Emirates serves meals on Royal Doulton bone china plates with exclusive Robert Welch cutlery, and menus are updated every month. There’s no “dine on demand” service but the airline does offer healthy meal options that are prepared without added saturated and trans fats, salt and sugars. On a typical menu from London Heathrow to Dubai you might see Potato and leek soup or Chicken liver pâté to start, and Roasted guinea fowl or Mixed grill for mains. Meals are followed by desserts, a cheese course and luxury chocolates and vintage port, so if you don’t fall into a food coma, you’re not doing it right! Emirates is currently serving Veuve Cliquot Extra Brut Extra Old on select flights and a Moët & Chandon Rosé Imperial on all flights from Dubai. Who wins? Both have similar meals, but Emirates has the edge with the champagne choices. We recently surveyed our customers 1,000 of SkyClub’s customers and Emirates came out a firm favourite amongst First Class and Business Class travellers. Both airlines offer fantastic service though and are consistently rated amongst the world’s best airlines. Whether booking Emirates or Etihad, we can get you Business Class fares that can’t be found anywhere online. Just call 02017 255 1234 and one of our friendly experts will find you the cheapest possible fare for your dates. By taking advantage of our discounted fares, you’ll have extra cash to spend on other things!